Treat yourself this Shrove Tuesday by making these nutritious, satiating and sensationally delicious pancakes – a super simple and super healthy way to start lent! They are free from gluten, dairy, nuts, refined sugar and can even be made vegan too! Nourishing your brain and frame, this recipe combines all the things your body craves to speed up the recovery process after a good workout: complex carbs, lean protein and energising fats. 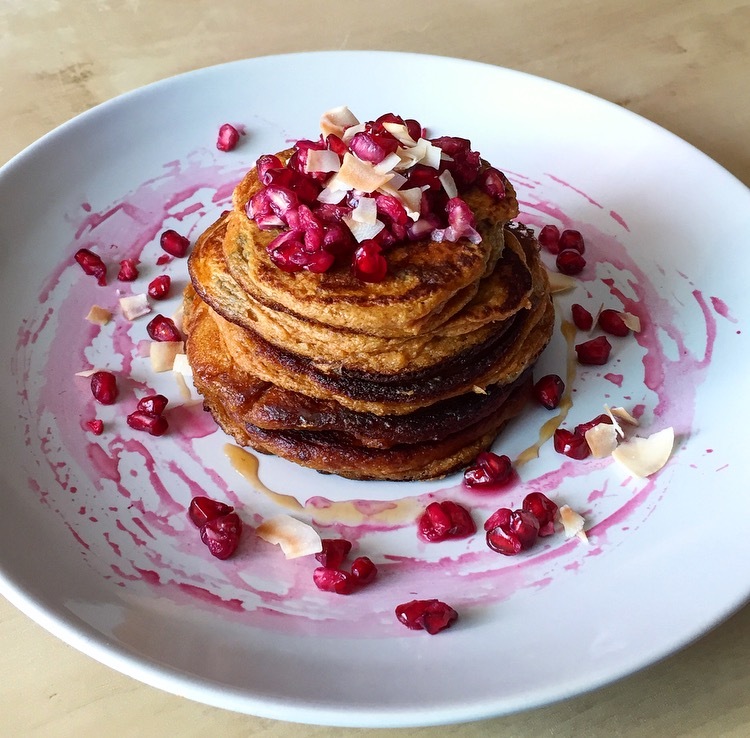 Made with a base of sweet potato – a wondrous superfood known for assisting with the repair of muscle tissue – these pancakes are bursting with essential vitamins and minerals, including A & C, magnesium, potassium and fiber. And why not round off this dish’s super anti-oxidant contents with a topping of fresh pomegranate (also in season); beautifully complimenting the orange and coconut flavours, pomegranate possesses three times as many antioxidants as green tea! Place all the ingredients in a food processor and blend well until there are no lumps and the mixture has a thick consistency. Don’t be alarmed that the mixture isn’t of ‘pourable’ consistency – they will turn out perfectly! The addition of ½ teaspoon of baking soda makes these pancakes fluffier and more American-style. If you can’t get hold of coconut flour, unsweetened desiccated coconut can work just as well. Put a tablespoon of coconut oil in the frying pan and place on a high heat. Spoon two tablespoons of the mixture into the pan to make small pancakes – about 10 cm in diameter. When they start to crisp up at the sides they will be cooked underneath and ready for flipping (about 1.5 minutes). I often use a spatula to help me flip them too. Serve with fresh pomegranates, chopped almonds and a good dollop of coconut or Greek yogurt and drizzle with honey.